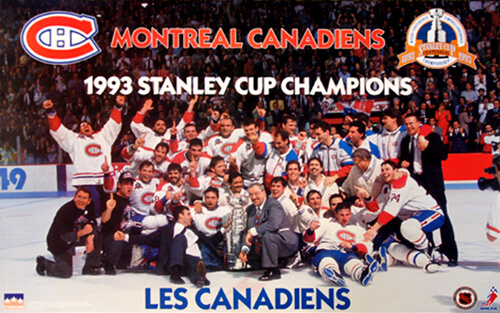 The 1993 Stanley Cup Final series was contested by the Los Angeles Kings and the Montreal Canadiens to decide the NHL championship for the 1992 – 1993 season. It was the first appearance in the Final for the Kings, and the 34th for Montreal, their first since the 1989 Final. The Canadiens won the series four games to one to win the team’s twenty-fourth Stanley Cup. The year 1993 was the 100th anniversary of the first awarding of the Stanley Cup in 1893. The 1986 Stanley Cup Final NHL championship series was contested by the Calgary Flames in their first Final appearance and the Montreal Canadiens in their 32nd. The Canadiens would win the best-of-seven series four games to one, to win their twenty-third Stanley Cup, and their seventeenth in their last eighteen Finals appearances dating back to 1956.